A realistic wooden Civil War era reproduction 1/2 Scale Cannon. 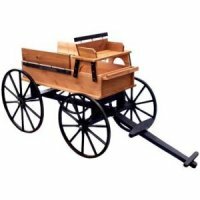 A western cedar wood cannon carriage featuring our own quality hardwood steam bent wheels. 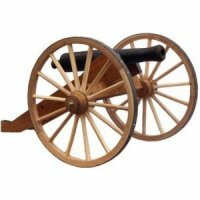 This is a great realistic looking cannon and makes a great lawn ornament. The barrel of the cannon is 33" long and has a 5" diameter. This wagon is shipped via UPS in three (3) boxes. We ship orders as soon as the order is completed, however, please allow 14-21 days for delivery. If you need faster delivery, please contact us we will try to accommodate your request. Dimensions: 40"W x 58"Long x 30"H with 30" Wheels.